There comes a moment in every championship hopeful’s career when he has to take the leap from fighting solid opponents to facing the elite. That moment arrives for UFC heavyweight Cain Velasquez at UFC 110. In Antonio Rodrigo Nogueira, Velasquez will be tested against a fighter who is widely considered the second-best heavyweight in MMA history. 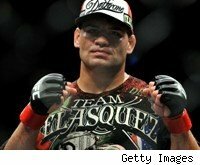 Can Velasquez possibly be prepared for such a challenge? Let’s take a look at the UFC 110 main event. UFC 110 Main Event Breakdown: Cain Velasquez vs. Antonio Rodrigo Nogueira originally appeared on MMA Fighting on Sat, 20 Feb 2010 09:02:00 EST . Please see our terms for use of feeds.